Alcohol burning stoves based on ethanol can be used for cooking, water heating and heating of buildings. The technology can be applied in households, institutions (e.g. schools) and industries where it is used for boiler heating. Ethanol is produced from sugar plants or other sources of biomass. An advantage of the technologies is that ethanol burning does not have the air pollution problems of simple biomass burning for cooking purposes. As ethanol provides a higher heat flux with no soot or smoke, cooking and hot water production can take place faster and pollution free. The greenhouse gas emission reduction contribution from ethanol cookstoves depends on the feedstock used for the ethanol, the distance from feedstock location to ethanol production, and what it replaces. According to Practical Action (2007), 2.4 billion people use traditional biomass for cooking, either wood, crop residues, charcoal, or animal waste. IEA (2006) states that an extra 200 million people worldwide will rely on biomass for their cooking and heating needs by 2030. Switching to cleaner fuels and having access to those fuels is one strategy for dealing with the problems of the health effects caused by the smoke and other pollutants released in enclosed cooking areas. The UN millennium project aims to half the number of households using traditional biomass. Improved biomass cookstoves can aim for 30% efficiency and reduces the amount of wood fuel used and thus decreases pollutant emissions. Alcohol burning stoves based on ethanol do not produce pollutant emissions but the technology is more expensive than traditional biomass, both in terms of purchasing the stoves and the costs related to the supply chain for the ethanol. Ethanol is an alcohol that is produced by fermentation of sugars from various crops, such as maize, sorghum, wheat, cassava and sugarcane. It can be used for different energy applications varying from boiler heating in industries to water heating and cooking. This description focuses on the latter service. There are several ethanol stoves and among their differences is the form of the fuel used. This can either be a liquid or a gel. Ethanol is a liquid, while ‘Greengel’, which has been developed in South Africa, is an ethanol fuel that is thickened and also contains colourants and flavouring agents. This makes it not as dangerous as the liquid as it does not spread if spilled. Greengel can be burned in a ‘greengel’ stove (see the image above), but also in other stoves. The equipment required for ethanol burning stoves is similar to existing kerosene stoves. Some ethanol stoves are made of stainless steel to minimise corrosion. In addition, supply chains for the ethanol stoves need to be put in place which cover the stages of production of the crop, the harvesting, the processing, and the final products or by-products produced. The choice of the crop, which could be maize, sorghum, wheat, cassava and sugarcane, depends on such aspects as the climate in the country, whether there is enough water to grow crops, quality of the soil, and geography. For example, it is important that the production of 'ethanol crops' does not deplete the quality and nutritiens of the soil and that it does not crowd out the availability of biomass for other purposes, such as food production. According to Zuzarte (2007), the penetration of ethanol stoves in the market in developing countries depends on several factors, such as: population density, rural and urban differences, income levels, proximity to energy resources, and social and behavioural patterns. In urban areas, people usually have to pay for the firewood, so that switching to an alternative, cleaner fuel may be easier than in rural areas where firewood is 'for free' (no opportunity cost for people's labour). Poverty in rural areas limits the population's ability to affort ethanol as a fuel for cooking (Zuzarte, 2007). Also, in urban areas income levels are on average higher so that more expensive technologies are more easily available. Another factor plyaing a role in the decision on whether to switch to a different fuel or stick to the traditional biomass-based cooking technique is the sometimes complex social behaviour in terms of the status of women and their role in decision making and cultural practices related to the fuel used for food preparation. Finally, for rural areas the distance to major ethanol supply centres is generally longer than for urban areas, with corresponding cost differences. In many developing countries, as Elias and Victor (2005) point out, multiple fuels are used, indicating that traditional biomass sources are only partly replaced by cleaner forms. In some countries the implementation of ethanol stoves may be hampered by regulatory or institutional structures. For example, the Gaia project in Ethiopia had a problem with contradictory government regulations which caused problems in implementing a household pilot study (Stokes and Ebbeson, 2005). However, it was found that institutional investors like UNHCR actually provided a more reliable and less risky basis for starting up a market than creating a domestic market alone. Barriers and drivers for establishing markets are similar to other technologies with quality control service back up, spare parts and maintenance being important for establishing a customer base. The RERED project in Sri Lanka is a good example of requiring good standards when setting up a market. In India, Rajvanshi et al. (2004) points out that the Indian Government needed to change regulations to allow low grade ethanol to be available as a cooking and lighting fuel for household purposes. There are obvious social problems in making alcohol available in this way which would have to be addressed. The ethanol supply would have to be treated to ensure that supplies were not misused given that ethanol is used for drinking. For instance, the ethanol gel described above could be a solution for that problem. The technology of alcohol burning stoves is developing all the time and there is a variety of stoves available on the market. In the EU the technology is mainly used for marine and mobile leisure applications while for developing countries it represents a chance to replace traditional firewood cook stoves. However, the lack of awareness of their benefits and the limited availability of microcredit could be a problem in adopting the technology. In rural areas where the firewood is still collected and 'free of charge', the economic incentive for changing cooking stoves might be smaller. In these areas, a stronger incentive could be the possible health improvements from cleaner cook stoves. For example, informational health effect campaigns could be helpful here. Consequently, the uptake of ethanol stoves may be larger in urban and semi-urban areas where people need to buy their fuels anyway and where income levels are higher. Most ethanol stoves can also burn methanol, which is produced from natural gas, since methanol stoves work on the same principle as ethanol. Some of the stoves have been developed and designed in the EU, where they are generally used for remote areas and leisure activities. There are many successful stoves already available on the market produced by manufacturers in the EU and a few in developing countries. For example, in Malawi, the ‘Marko Superblu’ stove has been developed which claims to have a very high performance with a burn temperature of 700-800 oC compared to 450 oC for paraffin. The Superblu stove can convert to a heater by the use of a ceramic cylinder which fits over the top of the stove. They also market an ethanol-based superblu lamp for lighting. 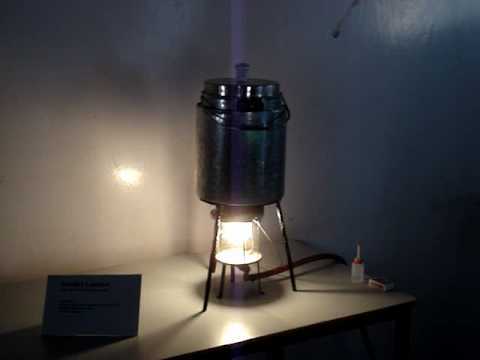 In India, the Nimbkar Agricultural Research Institute (NARI, India, established in 1968 by Mr Nimbkar) has developed the NARI stove (Rajvanshi et al., 2004) by modifying an existing pressurised kerosene stove which uses either a standard or a dilute ethanol mixture derived from sugarcane or sweet sorghum (see Figure 1). Such a dilute ethanol is produced locally in illicit stills for drinking. Ethanol is usually used at 85% concentration v/v (=volume/volume) and can be a fire risk. The NARI stove dilutes ethanol to 50% v/v and makes it a safe cooking method. Stoves may be designed as pressurised or unpressurised and the NARI stove above is pressurised. Another example is the project Gaia supported by the Shell Foundation which involved technology transfer of alcohol burning stoves already developed in Europe and North America to developing countries (Stokes and Ebbeson, 2005). Shell Foundation is extending its experience with ethanol stoves to Brazil where ethanol is already available as a biofuel. They target Jequintinhonha, a very poor area of Brazil where fuel wood is the most common source of cooking fuel. In collaboration with a range of partners a pilot study of 100 ethanol stoves will be carried out. The programme will assess the acceptance of ethanol as a household fuel and develop a plan to build a micro distillery to support stoves in a community. Ethanol distillation is economic on a small or large scale. For the stoves identified above, markets exist in developing countries, but an important aspect of their applicability is that they must be coupled to the supply chain for the fuel. These stoves are competing with the improved cookstoves which use 30% of the biomass for the same cooking service provided by an open fire. In Kenya, for instance, ethanol stoves have not been widely used. Instead, the Upesi improved cook stove is popular and interventions include hoods and windows in the kitchen (ENTTRANS, 2008). Improved cookstoves are very cheap but do not last as long as the ethanol stoves. Grimm et al. (2002) describe an EU-China joint venture on the development of a biomass heating and cooking stove project under the EU-China Local Authority linking programme. The available stoves are low efficiency (15-25%) and by producing air pollution these stove contribute to air pollution. Grimm et al. (2002) quote the annual market capacity in Beijing for stoves at 10 million according to statistics from the Ministry of Agriculture. In 2002 only, 3 million units were being produced commercially so that a large market for efficient low emission stoves in China remains to be explored. As explained above, switching to cleaner fuels and having access to those fuels is one strategy for dealing with the problems of the health effects caused by the smoke and other pollutants released in enclosed cooking areas. Some alternatives are not necessarily affordable for the poor, such as liquefied petroleum gas (LPG) or biogas, but ethanol, as well as methanol and biogasification are good alternatives. Introduction of chimneys and smoke hoods are also viable options. Improved biomass cookstoves can aim for 30% efficiency and reduces the amount of wood fuel used and thus decreases pollutant emissions. Efficiency figures for ethanol stoves are not available but the ‘superblu’ stove is claimed to be able to burn one litre of ethanol to provide heat for 15 hours, which is five times more than a conventional stove does. An important benefit associated with a switch to ethanol is the improved health conditions delivered from cooking with a clean smokeless fuel. With respect to emissions of non-greenhouse gas pollutants, Warwick and Doig (2004) show that the smoke and other pollutants from cooking on open fires is a major cause of disease and death in developing countries and especially for those in poverty. The level of particulates and products of incomplete combustion to which mainly women and children are exposed, leads to respiratory and eye disorders with a high incidence of death (1.6 million/year). In rural areas a successful introduction of clean cooking stoves, such as ethanol stoves, could lead to reduced drudgery and time saved for women and children in collecting firewood and this time can be used more productively. However, as Zuzarte (2007) points out, whether this benefit can be a reason for households to switch to ethanol stoves depends on the role of women in making household decisions. Also, health effects of carrying wood long distances could be avoided. The pressure on forests to provide fuel for cooking, heating and hot water is leading to severe degradation of forest resources with accompanying loss of flora and fauna though deforestation by logging and agricultural activities are still the major cause of global loss. Using a carbon-neutral source such as ethanol and/or a more efficient combustion process means that forest degradation can be halted and reversed. and tree cover has a chance to regenerate. This conserves biological diversity as well as increasing sinks for greenhouse gases. For example, in Malawi 50,000 hectares of forest are lost every year to provide wood fuel and charcoal. the feedstock used (by-product of sugar production, biomass distillation or from sorghum, or raw materials which could have been used for food production). If ethanol is produced from a raw material that would otherwise have been used for food production, then the greenhouse gas emissions related to producing this food in an alternative manner need to be incorporated as well. what is replaced by the ethanol: e.g. unsustainably harvested wood stove or fossil fuelled kerosene stove. Should the reduced need for firewood when using ethanol cook stoves lead to a reversal of forest degradation then this would also increase the capacity of the forest to sequester carbon. This would create an extra benefit for the climate. In sum, there will only be a climate benefit from the use of ethanol cook stoves, when it contributes to halting deforestation and when the CO2 balance of ethanol production is positive. For calculation of these GHG emission reductions, it is recommended to apply the approved methodology for thermal energy production with or without electricity project (small scale activities) which has been developed under the Clean Development Mechanism of the UNFCCC Kyoto Protocol (CDM). This methodology helps to determine a baseline for GHG emissions in the absence of the project (i.e. business-as-usual circumstances), how emission reductions below this baseline can be calculated, and how these reductions can be monitored. General information about how to apply CDM methodologies for GHG accounting can be found at: http://cdm.unfccc.int/methodologies/PAmethodologies/approved.html. According to the IEA (2006), an ethanol gel stove could cost between USD 2 and USD 20 per unit and the fuel cost would be USD 0.30-0.70/litre of ethanol. The ‘CookSafe’ stove can boil a litre of water in eleven minutes, and a litre of ethanol can last between eleven and thirteen hours of burn time. The NARI stove was estimated to cost Rs 800 to 1000 (between €12 and €15) if mass produced. The Superblu stove from Malawi claims that it costs approximately 2.5 Malawi Kwacha (MK) an hour (around € 0.014) to cook on this stove while it costs around € 0.14 an hour with charcoal and MK15 (€ 0.12) an hour with paraffin. As explained above, costs and availability of the stoves will also depend on in-country conditions, such as differences between rural and urban areas, 'competition' from 'free-of-charge' firewood, decision making responsibility of women, and availability of materials. Comparison of some costs of selected fuel options have been provided in the IEA (2006) (see Table below). * Costs of digester for biogas, cost of stove and cylinder for all other fuels. The activities to develop and implement ethanol stoves in developing countries have been financed either by national governments in developing countries (e.g. the ethanol stoves in Malawi and South Africa), or have resulted from an EU technology transfer partnership (Grimm et al., 2002), or been funded by charitable organisations such as the Shell Foundation. REEEP is another possible partner for promoting these technologies in a developing country (http://www.reeep.org). Non-Governmental Organisations concerned about the health effects of 3-stone fires could also engage in the use of these stoves. Many ethanol and methanol stoves are now commercially available but current information on their uptake is not available. Elias, R.J. and Victor, D.G., 2005. Energy Transitions in Developing Countries: a review of concepts and literature, working paper no. 40, Program on Energy and Sustainable Development, Stanford University, USA. ENTTRANS, 2008. Promoting Sustainable Energy Technology Transfers through the CDM: Converting from a Theoretical Concept to Practical Action, EU 6th Framework Programme, contract number: 022673. Grimm, H.P., Helm, P., Grassi, G., Lutter, E., Fjaellstroem, T. and Dong, W., 2002. Fostering EU-China cooperation in the development of the biomass fuelled heating and cooking stove market in China, 12th European Conference on Biomass Energy, Industry and Climate Protection. IEA, 2006. World Energy Outlook 2006, OECD/IEA, Paris, France. Rajvanshi, A.K., Patil, S.M. and Mendoca, B., 2004. Development of stove running on low ethanol concentration, Nimbkar Agricultural Research Institute (NARI), India. Stokes, H. and Ebbeson, B., 2005. Project Gaia: Commercialising a new stove and new fuel in Africa, Boiling Point, No. 50, pp. 31-33. Warwick, H. and Doig, A., 2004. Smoke: the Killer in the Kitchen, Indoor Air Pollution in Developing Countries, ITDG Publishing, London, United Kingdom. Zuzarte, F., 2007. Ethanol for Cooking - Feasibility of Small-scale Ethanol Supply and its Demand as a Cooking Fuel: Tanzania Case Study, KTH School of Energy and Environmental Technology, Heat and Power Technology, Stockholm, Sweden.